I Hit the Big One. Yep, I am now 70 years old. This seems so amazing to me and I keep wondering where all that time disappeared to. 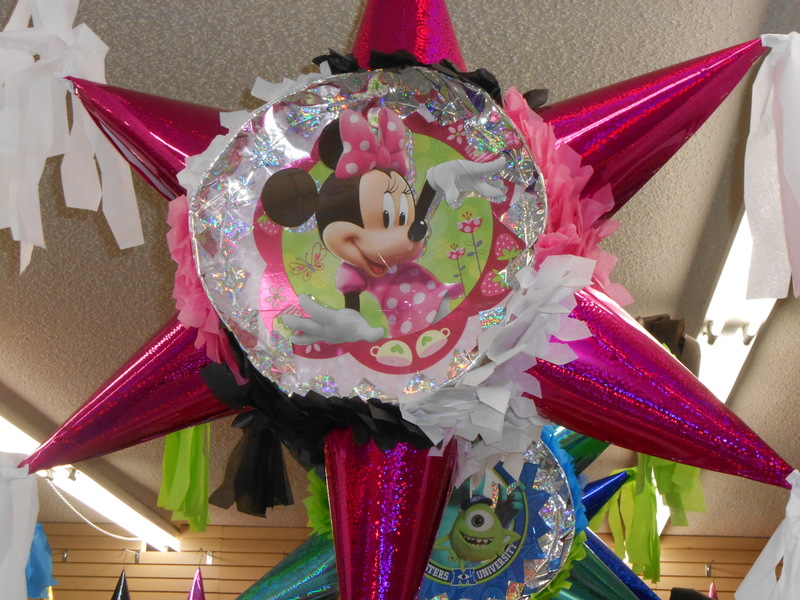 But I was rewarded with a fun fiesta from my family. They went all out for this occasion. First I got a dance floor. It was a beautiful setting. A beautiful cake with Frida Kahlo on it. The best decorations anyone could ask for and great food and goodies, like these little sombreros made from sugar cookies. Gifts are also fun to receive. The most precious was receiving a picture of my mom that I had no idea existed. A life long friend who is in the picture found it and gave me a copy. I’m thinking it was taken in 1953 or 1954 in front of our old courthouse. My family is always so supportive and loving that my heart is full of contentment. After a busy weekend it’s time to start sewing! This weekend was another one of those busy ones. We managed an estate auction and yes, we bought “stuff”. According to hubby it is “good stuff”. This was our very first one, quite interesting. Another birthday party, our only granddaughter is a big “11”. Here they are doing a family tradition of sorts. We do treasure hunts. They hunt for their party favors and the big kids (our grown children) write the clues. They’ve gotten quite imaginative in their clues. In the process of doing these hunts, the little kids have learned to use a compass, so now they know their directions. They’ve learned to solve their clues as a group, helping each other. Here they are searching for their next clue. This would be great for adults as well. Maybe searching for a bottle of wine, or a gift certificate, would sweeten the hunt. But now it’s time to get busy and start sewing. My sister-in-law has asked me to make her an apron and I need your help. 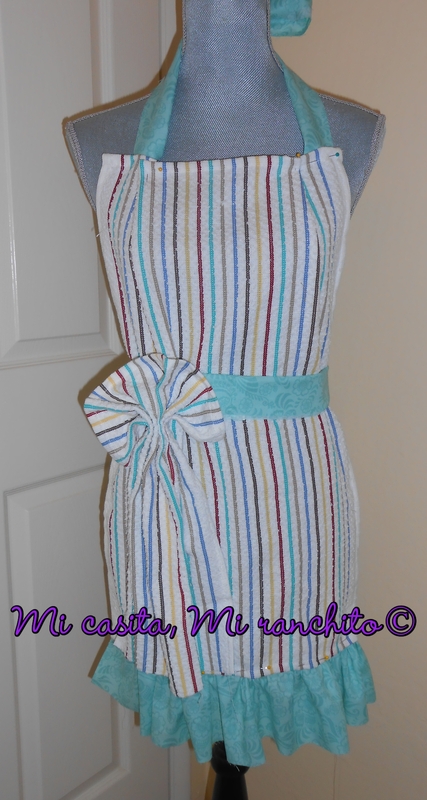 I’ve pinned some aprons on my mannequin (Dorita) and can’t decide which one to make her. 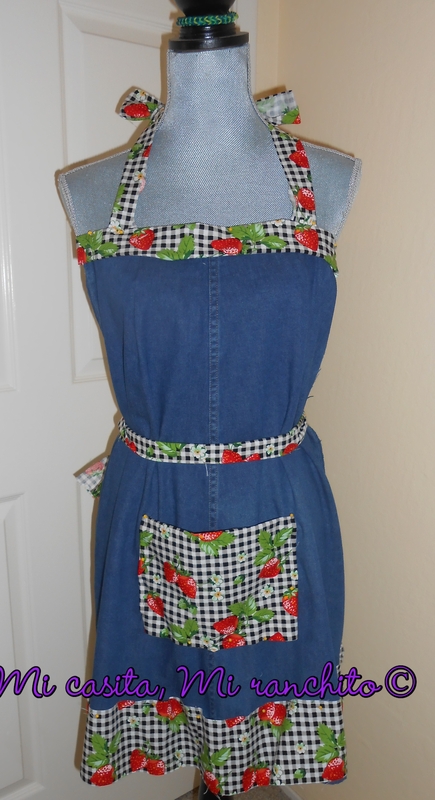 This one will be made from a recycled denim skirt with one pocket in the middle and trimmed with strawberry themed fabric. 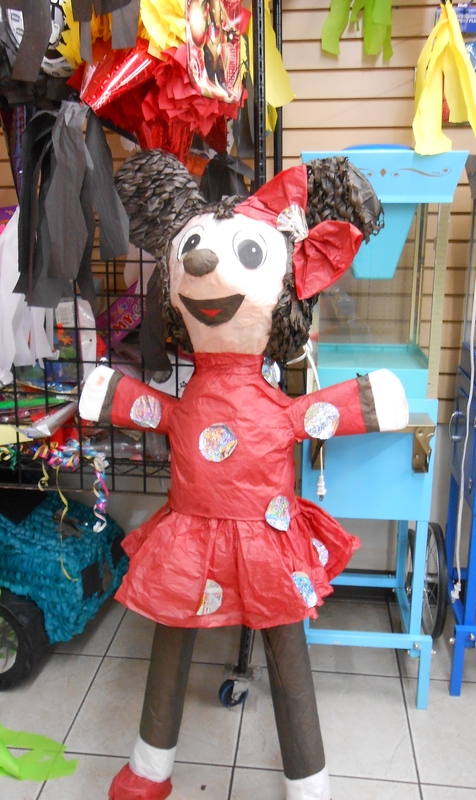 The next one will be made from dish towels and trimmed with turquoise fabric and another dish towel that looks like a bow attached to the front for wiping your hands. They will look somewhat like the pictures, but I might change it up a little. What, my Mexican tradition is from China? 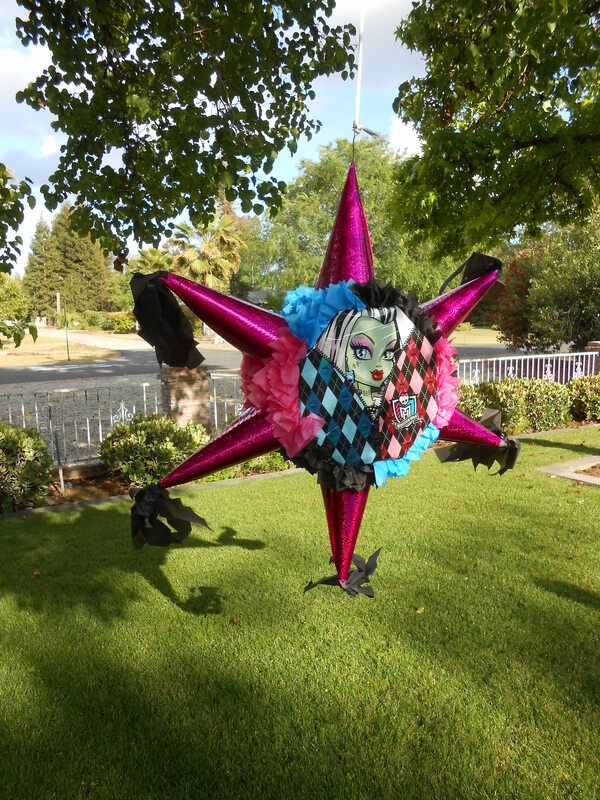 We always have piñatas at our family birthday parties, but I never knew the history on them, so I did some research. Turns out that it is believed the idea originated in China, and then did some traveling through Europe, Spain and then finally to Mexico. It seems that several countries have a similar tradition. And we have Marco Polo to thank for introducing it to the world. 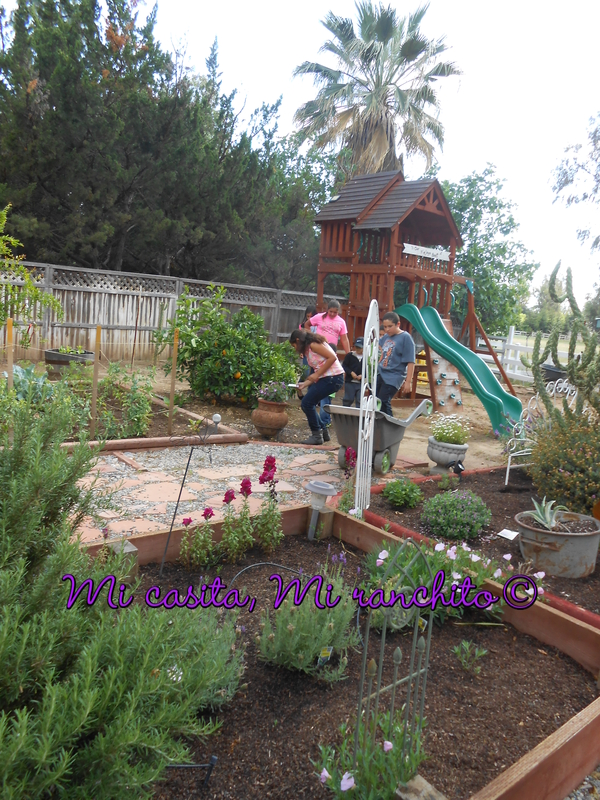 Well, that’s ok, it is our Mexican family tradition and we enjoy it. 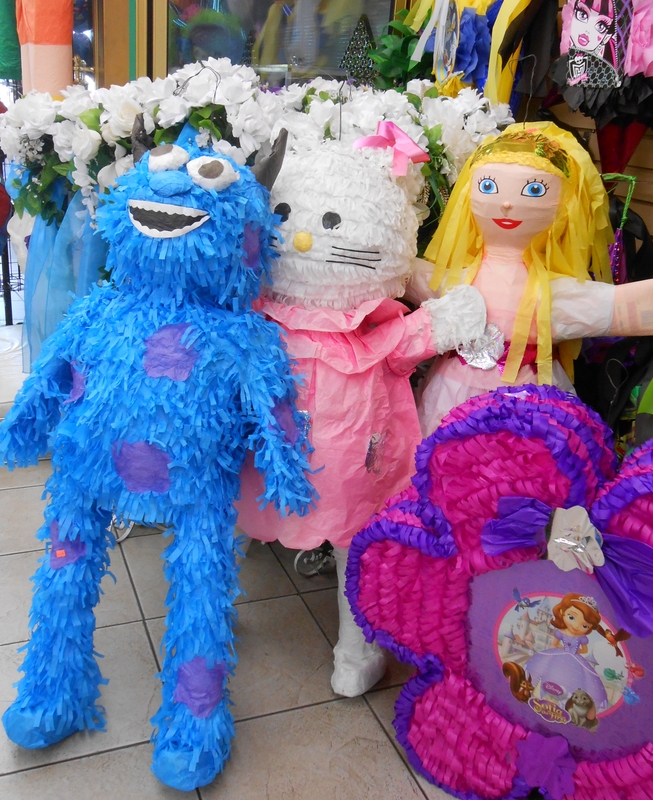 So,we went searching for the perfect pinata the other day. 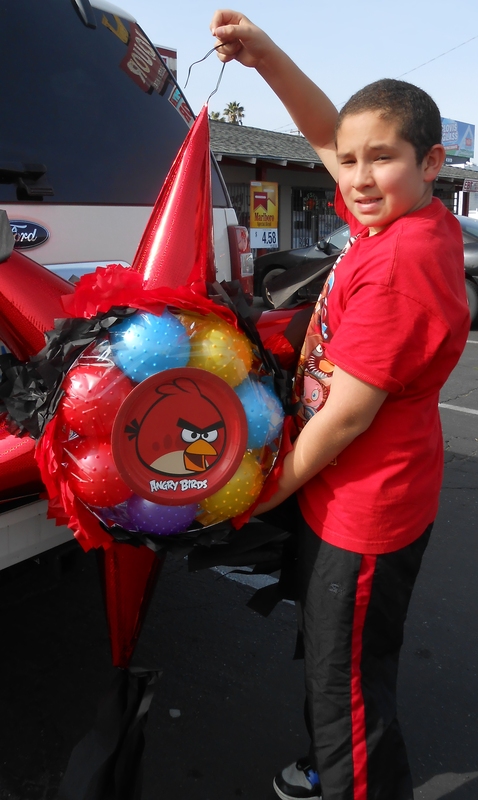 Our oldest grandson will be having a birthday celebration this week, so we picked him up and took him to the party store. 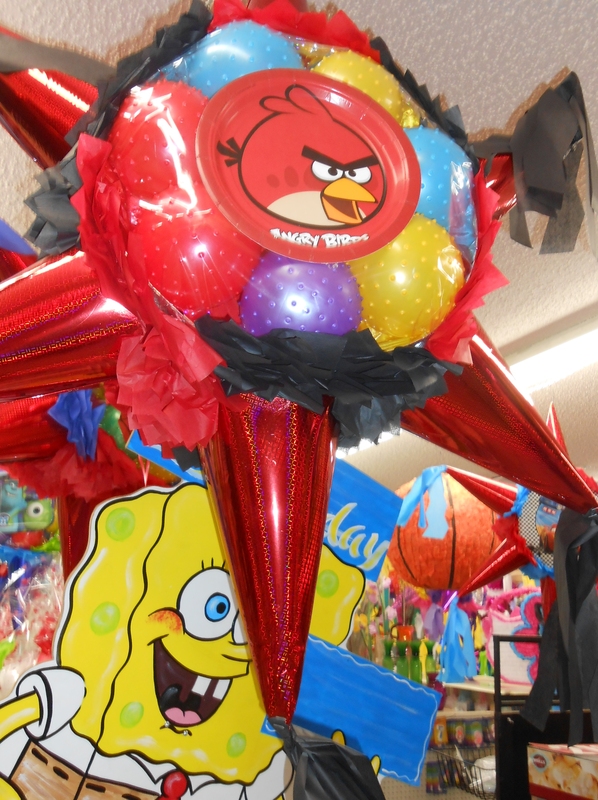 He walked through the aisles, eyeing all the different characters until he came upon the Angry Birds piñata and pointed to it saying this was the one. So into the car it went!